How far in advance should you book a band or DJ? So you’ve picked a date. You’ve picked a venue. That’s awesome! Those are the two biggest things to lock down when you get started planning a wedding, so you’re well on your way! Following this, people usually try to lock down 1 of 2 options: the next two things people usually lock down is the caterer and then the band/DJ. That’s all fine and good, but with the joy of starting to make arrangements comes the tough part of wedding planning: All those expenses and down deposits, and those can add up quickly! Because of this, you might start prioritizing and see how far you can spread out the bookings to help ye olde bank account. Totally understandable! Or maybe you almost have enough money saved up to book your dream band, but they quoted you a little higher than what you’ve got put away. Or maybe you have money saved up, but only enough to put it towards one or the other: a photographer or the entertainment. Which one should you pick?? What should you do?! 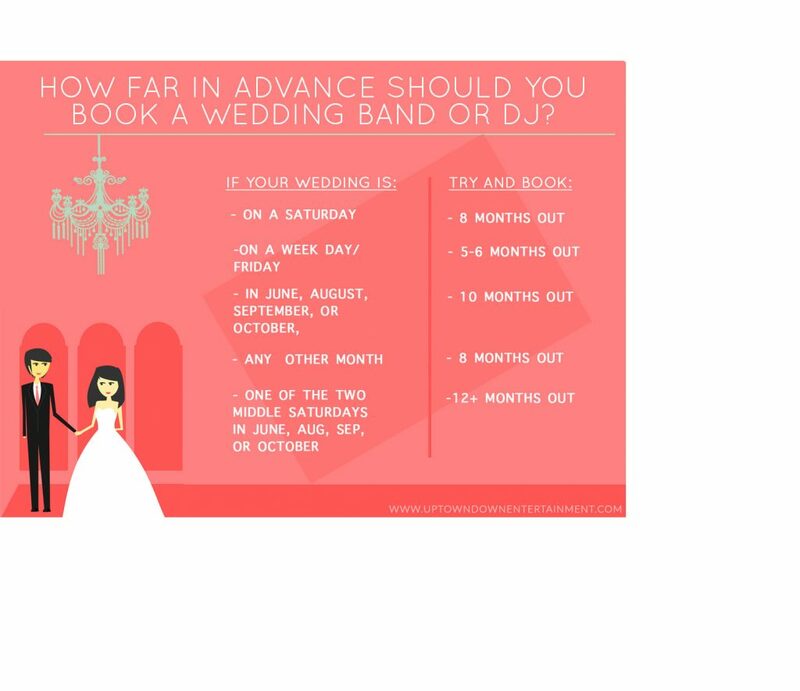 How far in advance should you book a wedding band or DJ? Bride crying because she didn’t book a band or DJ in time. Le sad! It’s a very common question! Mostly the answer depends on a few variables concerning your wedding. HOW POPULAR IS YOUR WEDDING DAY? 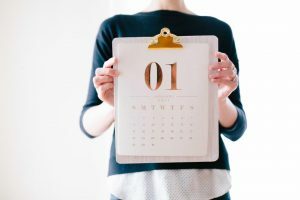 As with any in-demand resource that’s limited in time and space (especially during wedding season), it’s usually best to book sooner than later. One big reason for this is limited time. Bands and DJs can only perform so many weddings in a day! Last year, in Georgia (where Uptown Down is based) there were about 59,000 weddings. Over 90% of those had a band, DJ, or soloist performing. 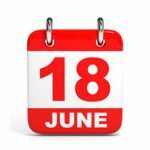 DID YOU KNOW: In 2016, the most popular day to get married was June 18th. As we’ve learned, most weddings happen on a Saturday, and most happen during 4 main months of the year (June, August, September, and October). So if the majority of people are getting married on those 16 Saturdays in a year, spots will fill up fast! Using those numbers, you’d have 58,500 people clamoring for 52 spots at BEST, and only 8 at worst (the two middle Saturdays in June, August, September, or October). That sounds a lot more serious than it really is of course (there will never be a shortage of bands or Djs to hire), but it just gives you some numbers to think about and consider. HOW IN-DEMAND/GOOD IS THE ENTERTAINMENT? No real surprise here: the best bands and DJs will book up first and fast. If you’ve had your sights set on the #1-rated DJ or band in your area, chances are you’re not even close to the only one. Those bands and DJs are the first ones to fill up. A lot of really popular bands are booked up 12, sometimes 16 months out EVERY weekend. It’s a great problem for musicians, but not so much for brides and grooms. HOW MUCH MUSIC DO YOU NEED? Some couples are stress-free and laid back with their planning. “Eh, we kinda know what we want, but we’re kind of down for whatever too, so….” In those cases, where you’re ok with things being a little more free-flowing, it might be ok to wait a little longer. However, if you have a very specific vision, with specific songs/arrangements, and you’re having a bigger band (and maybe they’re playing the ceremony, cocktail hour, AND reception), more lead time for the musicians = better results. Not to mention you won’t be pulling your own hair out trying to get everything thrown together last minute. Same with a DJ- if you have a very specific playlist or song list in mind, it can take some time to put that together and make sure all the transitions and ebbs and flows of songs are in order. DON’T START PANICKING YET HOWEVER…. Despite all the warnings and stats in this post however, don’t let it stress you out too much. Because there are a lot of DJs. And there are a lot of bands. And because of that, you’ll 99%-of-the-time be able to find some sort of entertainment option if you ‘accidentally’ wait till the 11th hour to find one. Now, this is no guarantee you’ll get a Michael Buble or Bruno Mars protege, but you’ll be able to get SOMETHING. There’s not really a GREAT way to know exactly how far in advance you should book a band or a DJ, but if you need a general rule of thumb, here’s a great infographic we made to help you!